The holy day when I became an Interisti. I've met the Brescia bloke who made that video, he is a top bloke and has a HUGE array of Baggio items, equipment and memorabilia. Also, who on earth says that Inter put Baggio's career on a decline? wtf....you ask Baggio where he was happiest and he'll say Inter. Baggio was a interista as a child, and in a interview last season, he said the only offer he'd consider to make a return to futebol would be one from Inter. Don't talk bullsh1t like that, anyone with half a brain knows that Baggio was most unhappy at Milan and that Milan were seen as the club who attempted to bring down Baggio. Lippi always favoured Fatass over Baggio, everyone knows that. That right there made Baggio lose his place in the NT, hence alot of people (that I know) blame Inter for this. I didn't say Baggio disliked Inter, that is you who put words in my mouth. errr, it wasn't about favouritism, I love Baggio, but I would have also started Ronaldo ahead of him, Ronaldo was better than him, thats a fact. Damn damn damn..R.Baggio...My Football idol. It wasn't like that at all. When Lippi coached us Ronaldo was plagued with injuries. Lippi favoured anyone over Baggio even primavera players. Roby said later Lippi had asked Baggio to be Lippi's eyes and ears among players, but when Roby refused to spy on players for Lippi, he didn't get the chance to play. Is there a player more celebrated than him in the history of Serie A? I've never seen anyone who has the support of every fans from the club he's played with. This player made it even more special by playing for all big 3 clubs and gaining all their support, despite playing very poorly for Milan. Forza Baggio per sempre! Hopefully, he'll coach us someday. He was the NT. He was the symbol of Italy in the world, I remember especially during USA94, I think they sold more Baggio shirts than cans of Coca Cola. Jake thanks for that clip, wonderful stuff. Last edited by Frisko; 05 Feb 06 at 10:54. I was watching La Grande Storia dell' Inter 11 last night and Baggio was so great with us..namely his games against Chievo and Real Madrid! I’m probably one of the few who never had and I guess never will developed any specific feelings (positive) towards Baggio. In fact I was against his move to our club. Mainly because of his move from Viola to Gobbi! And also because I never welcome any ex goobi player to my team – so R Baggio was no exception. Playing for the big 3 in Italy is rather a negative issue than positive. Honestly, you are the first person I have known to have no positive feelings for Roby Baggio. I really like Baggio.. He brings Italy to 1998 final almost singlehandedly... At that time I didn't really follow football, but I was amazed with his game at the moment. I supported italy 1998, simply because of him. Imagine if we had a coach like Mancio at the time Baggio being at inter. Mancio would use his 'favouritism' to play Baggio.. 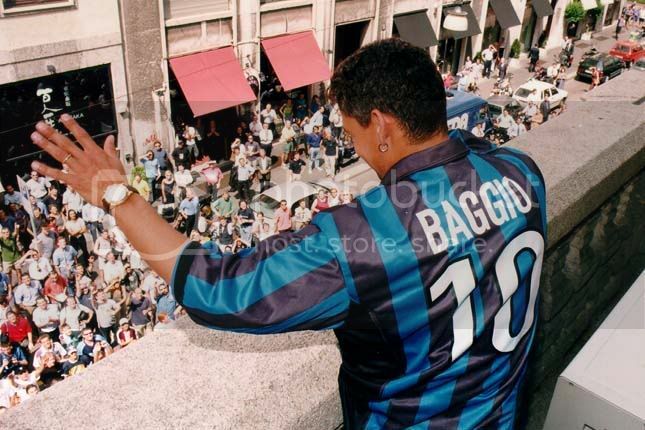 If I am not wrong, there were lots of rumours saying that Inter would want to have R.Baggio in the club, this time as a member of the management. It's a bird! It's a plane! No, it's SuperHan! The reason I love footie is because of Baggio. What a player! I fell in love with him....as a player ...during the 94 WC. One of the best, if not the best Italian player I've ever seen.